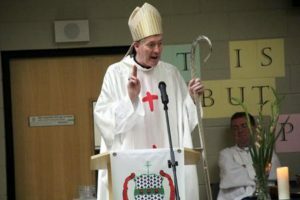 Bishop Denis Nulty, is inviting families across the 56 parishes of the diocese of Kildare and Leighlin to a ‘Picnic in Punchestown’ on the last Sunday of August. The picnic is part of diocesan preparations for next year’s World Meeting of Families and is also an opportunity to reach out to all families of the diocese and to gather them together for an event filled with fun, friendship and faith! Families have been asked to bring along their own picnic with a bit of extra food for a sharing table for those who maybe don’t have enough to eat. A special invitation has been issued to the families living in the two direct provision centres in the diocese, in Newbridge and Portlaoise, and also the refugee centre in Monasterevin. Bishop Nulty said that the diocese will be putting together special baskets for these families. The family picnic will take place at Punchestown Racecourse on Sunday 27 August from 1.00pm until 6.00pm, with an official opening liturgy at 3.00pm. Bishop Denis will lead a 4km fun walk around the race track and there will be face-painting, pet corner, stilt walkers, and lots of children’s activities and games. There will be a display of UN vehicles from the nearby Curragh camp with military personnel on hand to share stories about the Irish contribution to the UN peace-keeping force, as well as a display of the rations they eat while on duty abroard. Music for the event is being organised by Margaret Connaughton and Father Liam Lawton and will include local choirs and dance groups as well as some special surprise guests, including the country music singer, Derek Ryan and opera singer, Celine Byrne. Admission to the event is free, with ample free parking and some limited catering available. BBQ’s and gas stoves are not permitted. The day will be able to go ahead regardless of the weather, though lots of sunshine is anticipated! Speaking ahead of the event Bishop Nulty said, “We all liked going on a family picnic years ago and I think we don’t do it enough of it now, because we spend more time on phones and on the internet and spend less quality time with one another. You can find out more about the picnic on www.kandle.ie and by following the #picnicinpunchestown hashtag on social media.